If you ask anyone with even the slightest understanding astrology, what sign they would expect to be the most common among racing drivers they would undoubtedly say Aries. They would be right, in a sample of 106 drivers, the first sign is by far the most common, scoring 18, more than twice the expected score. The Chi Square figure for this sample is 0.00018, a stunning score for a sample so small. The next thing that would be expected is a strong and dominant Mars both by aspect and sign. Aspects to Uranus and Pluto would give even more power and explosiveness with the capacity to react in an inspired and unexpected fashion. For success in this world we would expect a strong Jupiter by sign and house. 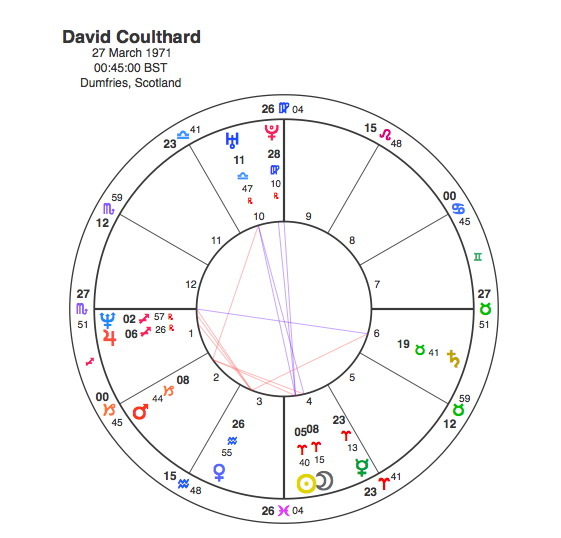 So the astrologically perfect racing driver has to be the 1997 Formula One World Champion, David Coulthard. Coulthard has the Sun conjunct the Moon in Aries as part of a T Square with an opposition to Uranus with an apex exalted Mars in Capricorn. Pluto at the very top of his chart, conjunct his career Midheaven, is also widely involved in the T Square. Jupiter is rising in its own sign Sagittarius. That is really all we need to know, but as ever a look at a few transits can add colour to the picture. Coulthard’s breakthrough came suddenly in 1994, when Pluto was on his Ascendant as he was brought in to partner Damon Hill in the Williams Renault team after the death of Ayrton Senna. His 1997 World Championship came when Pluto was conjunct his Jupiter. The turning point of his life came as Pluto went through his T Square from 2007 – 13. Pluto was square its own position in 2008 when he took part in his final Grand Prix race. Pluto was square his Sun in 2010, when he took up a new career in punditry work with the BBC F1 team. Pluto was square his Moon and conjunct his Mars when in 2012, he announced his retirement from racing.